This entry was posted in Current Events on March 7, 2011 by Michael Happy. 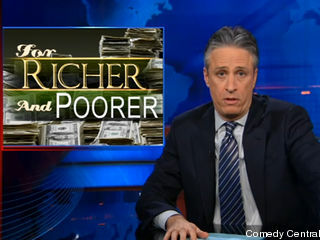 Jon Stewart exposes the hypocrisy of those who begrudge teachers their union-negotiated $50,000 a year plus benefits salaries but also fiercely defend the Bush tax cuts for the top percentile of wage earners and defend the kleptocracy and billion dollar bonuses of Wall Street. Watch the video here. Everybody belongs to an elite — like, say, teachers and nurses and police officers and fire fighters, who represent their common interests by way of labor unions; much the same way corporations have their common interests represented by Republican legislators and the “corporations are people too” Supreme Court of Roberts/Scalia/Thomas/Alito. This entry was posted in Democracy, Politics, Society on March 7, 2011 by Michael Happy.